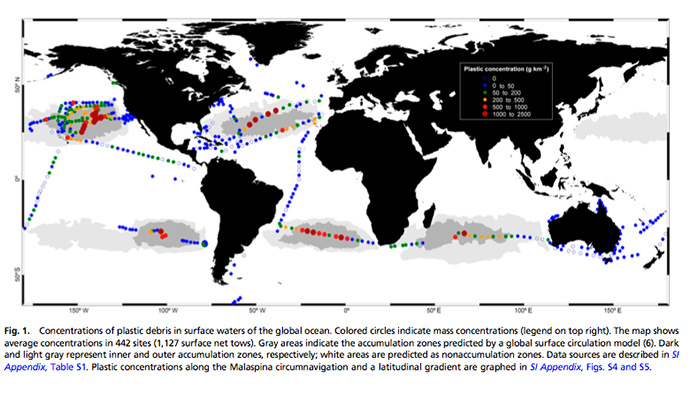 A vast amount of the plastic garbage littering the surface of the ocean may be disappearing, a new study suggests. Exactly what is happening to this ocean debris is a mystery, though the researchers hypothesize that the trash could be breaking down into tiny, undetectable pieces. Alternatively, the garbage may be traveling deep into the ocean's interior. "The deep ocean is a great unknown," study co-author Andrés Cózar, an ecologist at the University of Cadiz in Spain, said in an email. "Sadly, the accumulation of plastic in the deep ocean would be modifying this mysterious ecosystem — the largest of the world — before we can know it." Researchers drew their conclusion about the disappearing trash by analyzing the amount of plastic debris floating in the ocean, as well as global plastic production and disposal rates. 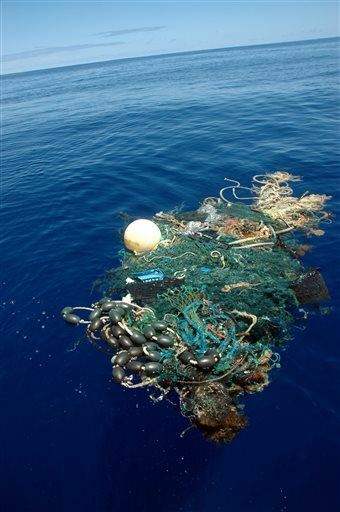 This Aug. 11, 2009 file image provided by the Scripps Institution of Oceanography shows a patch of sea garbage at sea in the Pacific Ocean. The modern period has been dubbed the Plastic Age. As society produces more and more of the material, storm water runoff carries more and more of the detritus of modern life into the ocean. Ocean currents, acting as giant conveyer belts, then carry the plastic into several subtropical regions, such as the infamous Pacific Ocean Garbage Patch. In the 1970s, the National Academy of Sciences estimated that about 45,000 tons of plastic reaches the oceans every year. Since then, the world's production of plastic has quintupled. The RV Hesperides tows along a net designed to skim the ocean surface, catching floating plastic particles (inset). Cózar and his colleagues wanted to understand the size and extent of the ocean's garbage problem. The researchers circumnavigated the globe in a ship called the Malaspina in 2010, collecting surface water samples and measuring plastic concentrations. The team also analyzed data from several other expeditions, looking at a total of 3,070 samples. What they found was strange. Despite the drastic increase in plastic produced since the 1970s, the researchers estimated there were between 7,000 and 35,000 tons of plastic in the oceans. Based on crude calculations, there should have been millions of tons of garbage in the oceans. Because each large piece of plastic can break down into many additional, smaller pieces of plastic, the researchers expected to find more tiny pieces of debris. But the vast majority of the small plastic pieces, measuring less than 0.2 inches (5 millimeters) in size, were missing, Cózar said. So what exactly is happening to the debris? One possibility is that it is being broken down into tiny, undetectable particles, whose impact on the ocean is unknown. Another possibility is that it is being carried into the deep ocean. Whether that's good or bad isn't clear. Less trash at the surface may mean less wildlife comes into contact with plastic. "The plastic pollution in surface waters can more easily interact with the ocean life, because the surface layer of the ocean hosts most of the marine organisms," Cózar said. On the other hand, small fish — particularly lanternfishes — may be eating some of these small plastic pieces, dubbed microplastics, and breaking them down even more. Because small fish are the ecological link between plankton and small vertebrates, and because commercial fish such as swordfish and tuna eat these small fish, it's important to understand whether the absorption of toxins from the plastic will impact these animals' health, he said. The findings were published today (June 30) in the journal Proceedings of the National Academy of Sciences.